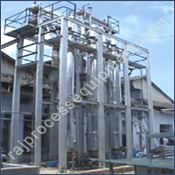 Zero Liquid Discharge Plants India. Zero liquid discharge systems have become a necessity for all the industries generating liquid effluents. Common effluent treatment plants in most areas have a limited capacity. The zero liquid discharge systems are normally incorporated to treat the R.O. reject streams. Zero liquid discharge plants consist of a combination of different types of evaporators depending upon the nature of liquid and it's contents. The waste liquid is concentrated to the maximum level in the evaporators which may be either falling film or forced circulation or a combination of both. The number of stages depends upon the quantity of liquid to be handled. The water evaporated from the evaporators is condensed in the condenser and can be reused in the process. 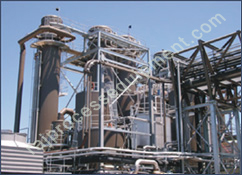 The concentrated liquid is then dried in either a spray dryer or a agitated thin film dryer. The dry product obtained in powder form can either be used as a by-product or can be sent for land filling. Higher steam and power economy. Simple construction which is easy to operate. Carefully selected material of constructions taking into account the product properties. Skid mounted units up to certain capacities. Capacity range from 1 kL per day to 1000 kL per day. Pure condensate from the system which can be reused in process.